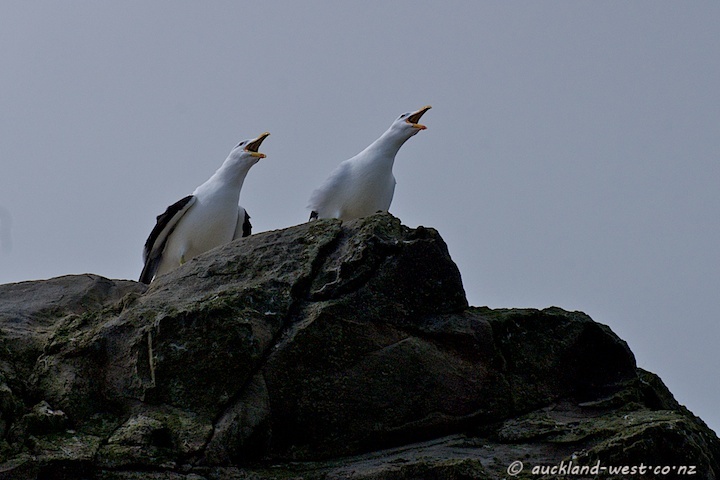 On my recent visit to the gannet colony at Muriwai I also caught this finely choreographed display of two black backed gulls (Larus dominicanus) screeching in unison at the edge of the nesting platform of the gannets. Looking up from Flat Rock. 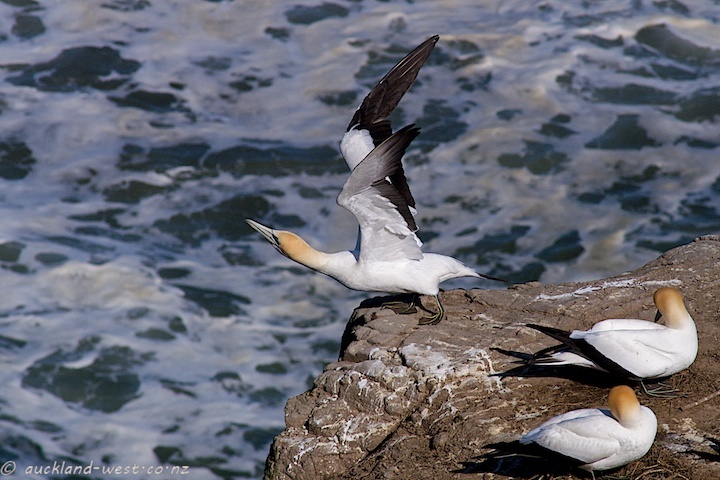 In a moment this bird will be gliding from the height of the nesting platform – Australasian Gannets (morus serrator) have a breeding colony at Muriwai. For the next 8 months or so, they will be here, before flying off again to Australia. Clumsy as they are on land, they are elegant fliers and amazing divers. 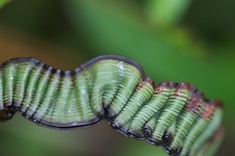 An expert told me that this is an instance of fasciation — fascinating! The images date back several years, and I have not seen much of this phenomenon in recent times. But I like the top picture a lot (it is a natural sepia toning anyway, so a good candidate for black and white), and the story is intriguing. 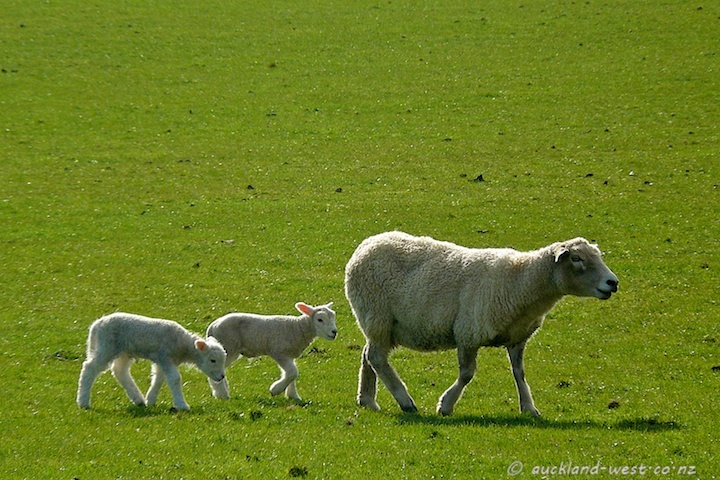 Three more examples below. The synchronized swimming of swans is a thing of beauty and elegance. 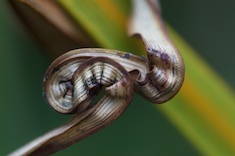 Seen in the wetlands near Karekare Beach. 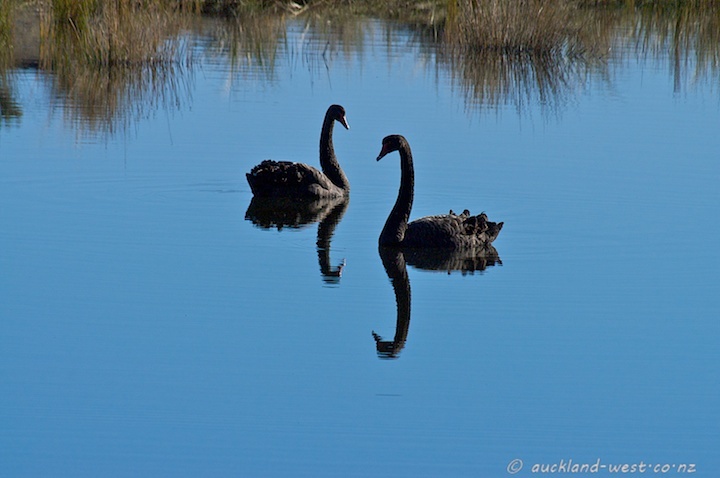 Find more weekend reflections at James’ Newtown Area Photo. 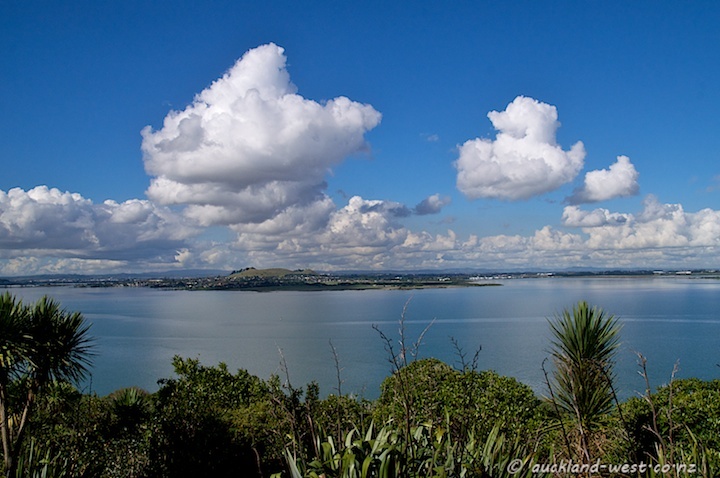 The view from Waikowhai Lookout over the Manukau Harbour towards Ambury Farm Park and the volcanic Mangere Mountain. 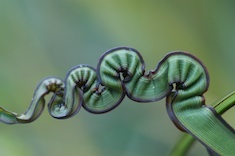 Check out the Manukau Coastal Walks. A Skywatch Friday photo. More Skywatch images at the Skywatch Site! 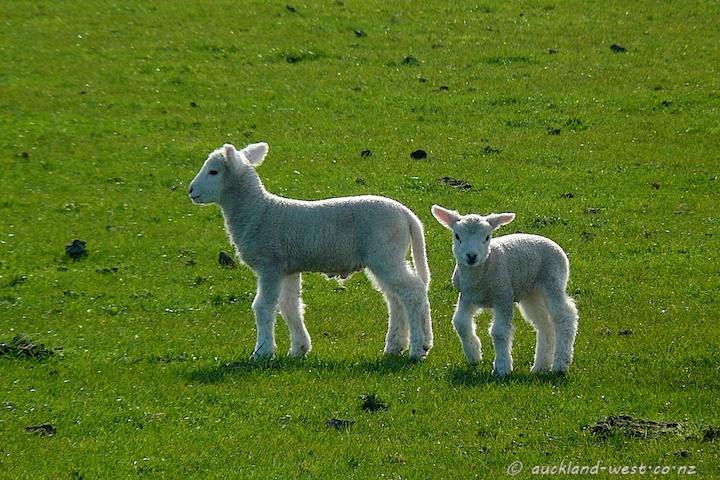 Seen on the way to Muriwai. 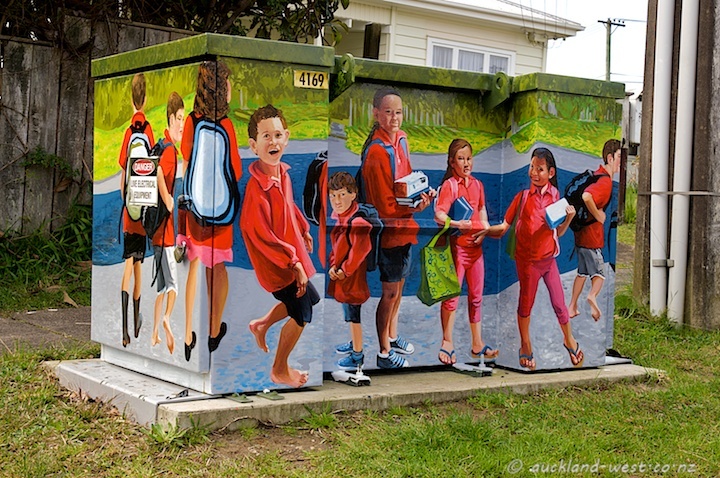 This transformer is found in Croydon Road, not far from the gates to Fruitvale School. 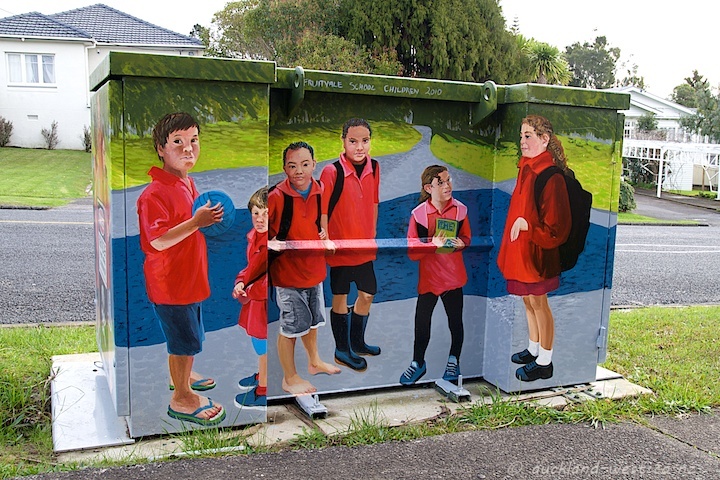 It was painted by Judith Moore-Chisholm in 2010, depicting children’s scenes. As the artist told me, the faces are those of actual children at the school. 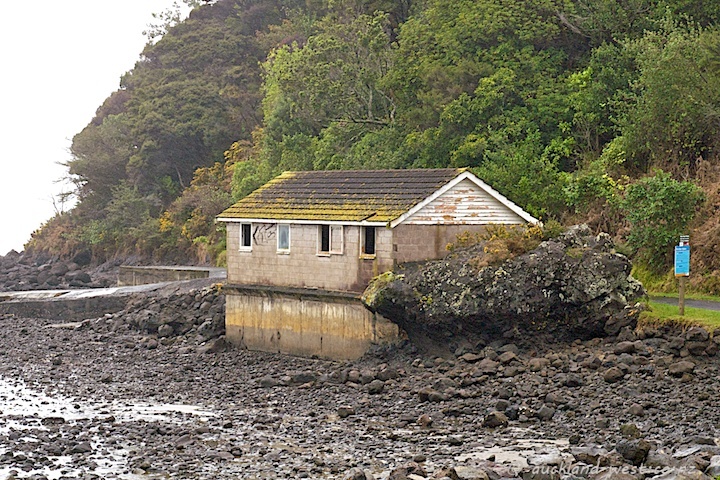 This ageing boat house watches over the outgoing tide on a grey and misty morning. It is located at the end of Huia Road, where Whatipu Road leaves the coast to cross the ranges. The hill rising behind the building is Te Komoki (Jackie Peak). This is the Pah Homestead, the new home of the TSB Bank Wallace Arts Centre mentioned in yesterday’s post. 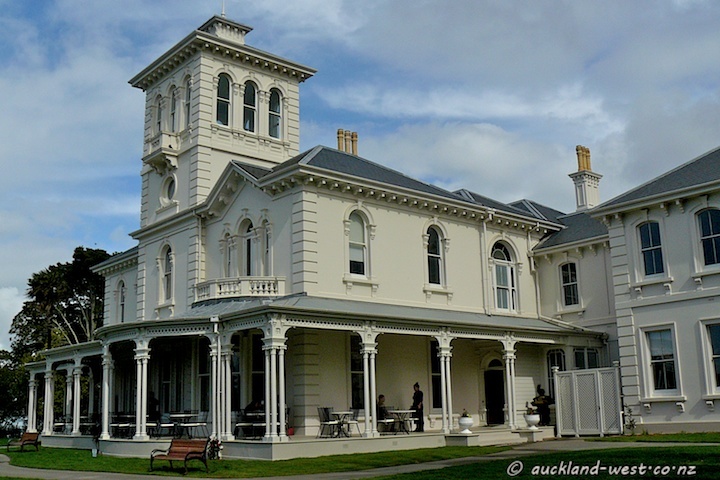 Built between 1877 and 1879 for the Auckland businessman James Williamson as ‘gentleman’s residence’, it was one of the largest houses of the period. 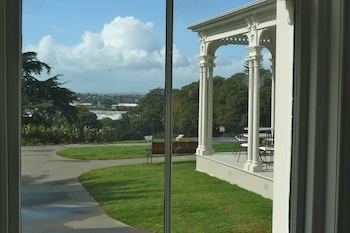 An impressive mansion, housing an impressive collection of contemporary New Zealand art. All this surrounded by Monte Cecilia Park. Last Sunday, the TSB Bank Wallace Arts Centre had its opening day at the Pah Homestead (72 Hillsborough Road). This grand mansion has become the new home for a remarkable collection of contemporary New Zealand art. 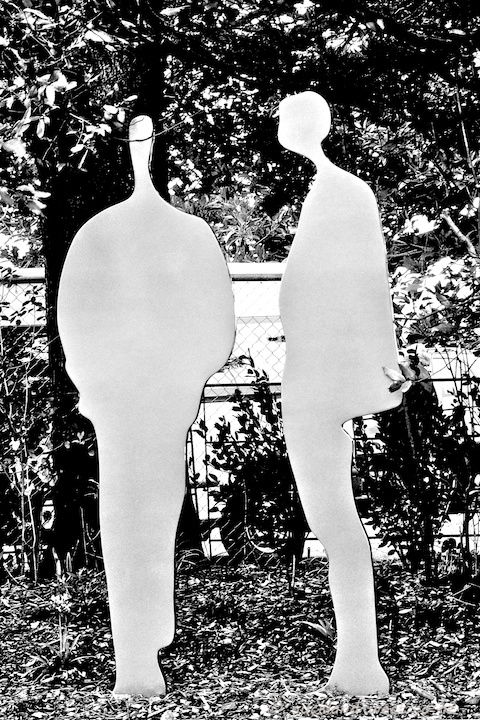 Above is shown a sculpture by Richard Wedekind in grey painted steel, entitled “Everyone’s an Art Critic”. It is found in the garden outside the “Morning Room”. 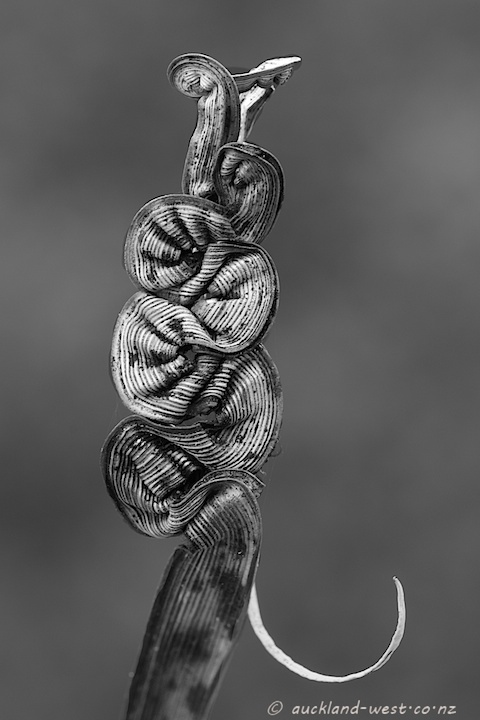 The above shot seemed ideally suited for high contrast black and white treatment. A picture of this sculpture in a different setting and in colour can be found in the database of the Centre. I am grateful to curator Nicholas Butler for pointing me to this page. 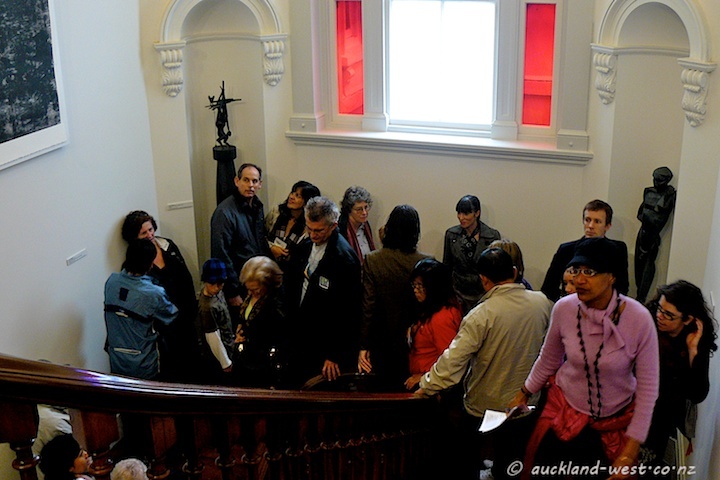 The picture below shows how the citizens of Auckland embraced the new amenity – a few more visitors than you would like for a gallery viewing, but just fine for a great celebration. 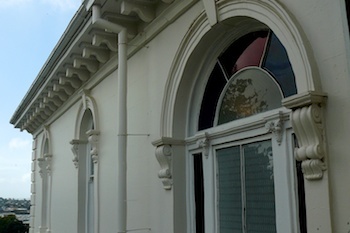 The sculptures in the alcoves are by Paul Dibble, left, and Terry Stringer). Go visit the place, it’s good and it’s free!